Reception: September 7, 2018 | 5:00 – 9:00 p.m.
Gallery talk about her work beginning at 6:15 p.m.
Sandra Perlow is a Chicago-based artist. Her two-dimensional works start from casual observations made on walks throughout the city where she sketches her surroundings. In the studio, these reflections are transferred to surfaces that are worked over with combinations of painted, monoprint, and collage techniques. Textiles are coated and obscured, while their raised silhouettes remain. A history of shapes becomes evident, new and old together, like buildings on a city block. Disparate experiences and moments of everyday life merge into a single stationary plane. Memory is a tool that Sandra Perlow relies upon as she creates abstract readings of reality, everyday objects, and experiences. The sources for an artwork’s content are formed in response to visual and sensory information in Perlow’s immediate surroundings, translated through recollection. She documents patterns and features gathered from architectural structures, interior and exterior spaces, movements and interactions of passersby. Forms and colors are layered over one another to symbolize impressions made in a glance. Perlow’s career also records the changes in herself as an individual. She maps the structures of everyday life, both social and concrete. In doing so she exposes the physicality required of a painter. Sandra Perlow is the recipient of several awards as well as residencies at Yaddo, the American Academy in Rome, the Chicago Artist Coalition, and at The Spertus Institute. In 2013, she was invited to speak about her work in relation to that of Philip Guston at The Art Institute of Chicago. Her works have been exhibited at Dubhe Carreno Gallery, Chicago, IL; Rockford Art Museum, Rockford, IL; Brauer Museum of Art, Valparaiso, IN; and Linda Warren Projects, Chicago, IL; among others. She was a member of the Spertus Institute’s Midwestern Arts Lab residency program for 2016-2017. Her work is included in the permanent collection of the Rockford Art Museum and was the honoree for Woman Made Gallery’s 26th Anniversary Gala in May 2018. The web site for her work can be visited at sandraperlow.com. Images (Above): Sandra Perlow, Slash Back (detail), 2018, Acrylic and pen on paper, 30 x 22 inches. 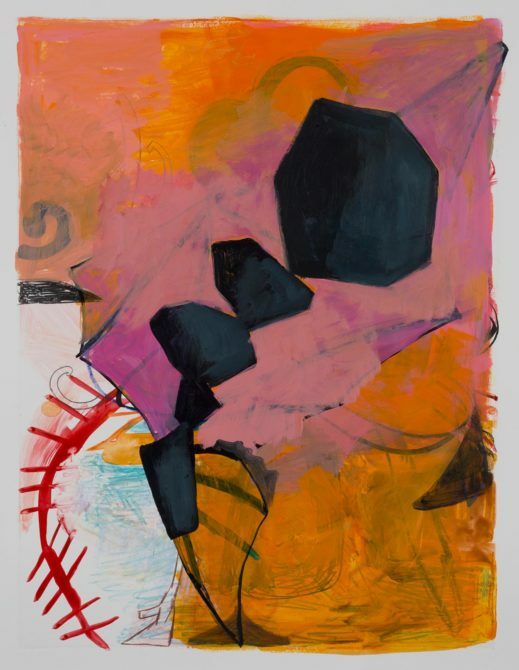 (Below): Sandra Perlow, Whisper Back, 2015, Monoprint and acrylic on paper, 30 x 22 inches.